The new Refuse Redistribution plan is brilliant. And this Memorial Day was a testament to its success. For those readers that haven’t heard, the leadership of Southern California cities have banded together in a heroic effort to reduce the immense amounts of trash going into our landfills. 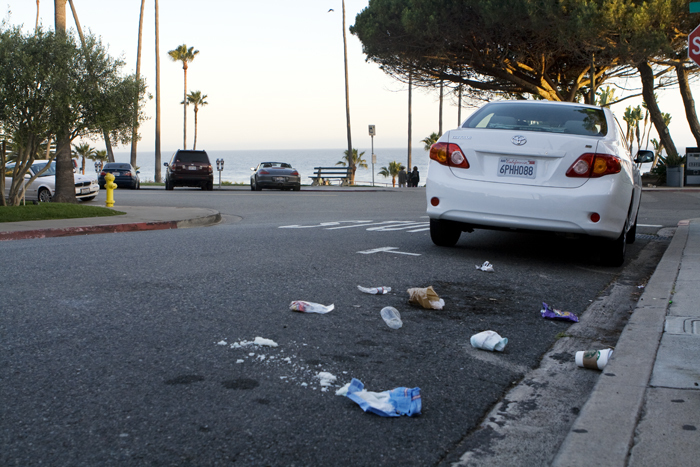 The plan: use well established travel and recreation patterns of Southern California residents to redistribute the trash to the streets, and more importantly, beaches, of coastal towns. Memorial Day was the perfect day to launch the campaign, not only because it is the de facto opening of the summer beach season, but because of America’s strict adherence to keeping the memory of those who fought and died for this great country at the forefront of our awareness on this drunken holiday. What better way to memorialize our country’s unsung heroes and patriots than by showing our commitment to being good stewards of the community and giving our all to the Refuse Redistribution plan? I only have one complaint: we didn’t think big enough. Several pieces of trash per square foot across the entire coastline of Laguna Beach is not insignificant, but if we are going to keep up with our voracious, almost incomprehensible appetite for disposable products and their accompanying packaging, we are going to need to step it up. We are going to need our trash per square foot ratio to hit the triple digits. That’s right, hundreds of pieces of trash per square foot is the only way forward. I know what you’re thinking – I forgot about recycling. Not so. A long walk on the beach this evening made it clear – your fellow citizens are doing their part to lighten the load on our compatriots at recycling centers across the region. There were water bottles, Starbucks to go cups, sunscreen tubes, sandals, buckets, balloons, Styrofoam cups and plates, plastic knives and forks, plastic bags, glass bottles, and other assorted plastic flotsam everywhere. Heisler Park, gateway to our city's marine reserve. I only have one other small complaint: most of the trash was too close to the waterline. As the tide comes in, which it did a few hours ago, our collective waste was mostly washed away, carried by the currents toward other beaches and coastlines further afield, and eventually to the great garbage patch in the North Pacific Gyre. Don’t get me wrong, that’s a great method of disposal. Its mode of transport – ocean currents – has a low carbon footprint, and it’s far from shore where no one will see it. But that is actually the counterintuitive problem here. 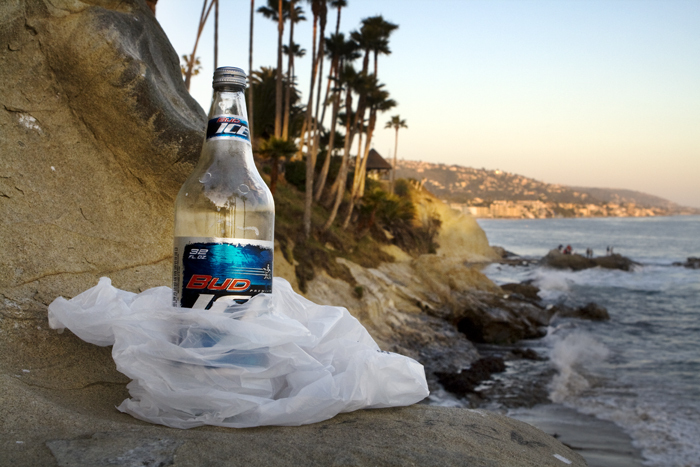 If all the trash is washed away within a few hours of it’s deposition at our shoreline, it won’t serve as a reminder to future beach visitors of our efforts. If we simply put the trash a little higher up from the water line, it will stay with us longer, and stand as a small memorial to the great work we all did on this Memorial Day. So next time you come to the beach, please, remember those who fought for the freedoms we all enjoy, bring as much trash as you possibly can fit in your vehicle, and put it on the beach, but well above the mean high tide line.